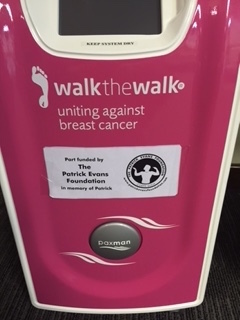 This November The Patrick Evans Foundation made a significant contribution towards the purchase of a scalp cooler for a local hospital. This equipment is worn by cancer patients undergoing chemotherapy aiming to limit the amount of hair lost during treatment. Supporters of the Foundation who have used scalp coolers as part of their cancer treatment told us that it made a significant difference to their hair loss. They also said that this had a positive effect on their general well being and helped them remain optimistic during their illness.